The Marriage Certificate I has space to write names of the couple, date and location of ceremony, signature of witnesses and person solemnizing the marriage. 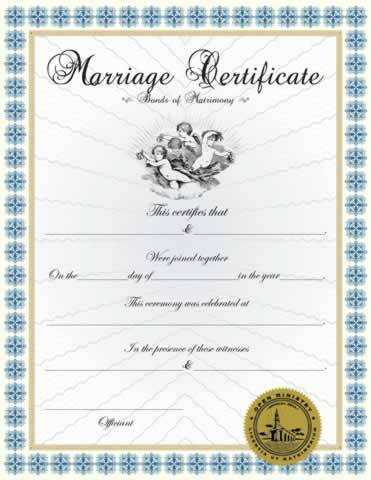 The Marriage Certificate is to be completed by the couple, minister and/or witnesses. Decorated with our gold embossed ministry seal. Sherry, please visit https://support.oministry.com if you need to help or support. The Marraige Certificate I received was not only professional looking but gave me a feeling of regal and highest value as an ordained minister. Top notch on all levels! Thanks!! It was really nice the couple I am to marry next month loves the style and so do I.
I received my membership package last year(2013). Everything was in excellent condition. I will preform my first Marriage Ceremony this year (2014), which happen to be my daughter. I Thank you in Jesus name, Amen. These certificates are so beautiful, that I purchased several so I could feel prepared!! nice but rather expensive.....do you sell just the seal? Our organization is here to offer assistance to our congregation and is pleased to offer you our ministerial services. We appreciate your comments and support of Open Ministry. We strive to offer 5 star service to all our ministers. Please contact us directly at info@open-ministry.org with any questions, concerns or if you would like additional information. A beautiful and official document that satisfied the legal requirements and the happy couple! A lovely, heavy weight paper with a great look. I was proud to present it to the newlyweds.